The final installment of the Search for Lost Legacy adventure arc clocks in at 47 pages, 1 page front cover, 1 page editorial/ToC, 1 page SRD, 1 page back cover, leaving us with 43 pages of content, so let’s take a look! This being an adventure-review, the following obviously contains SPOILERS. Potential players should jump to the conclusion. All right, still here? This installment takes place in Vargon’s former private sanctum, which is now under the command of his erstwhile second in command Damon Light-cleaver, though e.g. a Dark naga and certain servants provide ample opportunity for the PCs to sow discord within the ranks of their opposition – as this level is still very much inhabited, it should come as no surprise that the focus is a different one that takes a step away from the theme of abandonment and decrepitude. 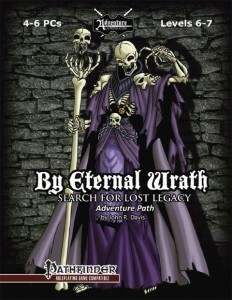 In game, this proved to be at once an interesting change of pace and a flaw – while the series so far has excelled primarily in its indirect storytelling, so far almost all of the hints, from diary-entries to the theme of the sins of the ancestor inherited, this module changes its focus into a dungeon that is still operational, with the ancient wizard’s lich-transformation being the central theme – sabotaged though it is, it is up to the PCs to complete it and annihilate the proto-lich while it phases back into reality in order to truly stop the wizard. While this is by no means an uncommon trope, it does not sport advice to trouble-shoot the very reasonable refusal of PCs to engage in exactly this practice, which can grind the module to a pretty nasty halt -essentially, the series fails to provide a good reason to actually try to destroy Vargon instead of leaving him in limbo. The exploration of the complex and braving of halls used in the process of lichdom-apotheosis works well as a concept per se, but still – from a dramaturgical perspective, I do think this pdf flounders. On the plus-side, the social interactions and Bluff/sense Motive-boxes provided go above and beyond for the DM, with plenty of intriguing quotes that should not leave even the most inexperienced DMs baffled – two thumbs up for these! That being said, to me, the internal consistency and realism the series evoked so far falls completely apart here – with so many powerful, unbound villains and his second-in-command here, with the transformation not completed, this whole level made no true sense to me. How could it go unnoticed? How can it be that Vargon hasn’t been properly finished off? With so much of the complex remaining essentially barren and lost, why not extend the domain and claim those resources, rife for the picking? The reasons provided within the context of this module remain flimsy at best and, to me, invalidated the carefully established sense of cohesion and realism established over the curse of the series. The pdf does collate Damon’s story and the proto-lich template in the appendices (oddly featuring the 3.X-template as well as the PFRPG-version, though the 3.X-content has otherwise been purged from this pdf…) and sports the map of the complex in a player-friendly version as well – kudos for that. Editing and formatting are good, though, as in the previous installment, some fluctuations in writing quality of both fluff and rules-text can be found herein. Layout adheres to a beautiful two-column full-color standard with gorgeous full-color artwork and the pdf comes fully bookmarked for your convenience. John R. Davis’ series’ final installment is challenging for the level-range, though not in an undue manner – my players considered it not that hard, but then again, the mechanical challenge was never the forte of the series. This module, ultimately, constitutes the logical conclusion of the series as foreshadowed in part III, though it does so in a disappointing manner. Ultimately, the threat foreshadowed is invalidated pretty much, the sense of logical cohesion established carefully via indirect storytelling crumbles somewhat apart. The extremely compelling leitmotif of the dungeon, carefully established in part I and II, already somewhat diminished by installment III, now completely crumbles apart and, unfortunately, takes what makes the series special with it. Where the first two installments, and to a lesser extent the third, stood out due to the atmosphere evoked, the unique sense of a strange archeology, this one almost negates that very premise by undermining the very foundation that made this stand out – the presence of a BBEG beyond the story’s focus/boss and the traitorous creatures herein almost constitute the antithesis of the cohesion the series has worked so hard to establish. Don’t get me wrong, I don’t expect a sense of Gygaxian realism in my dungeons; I can have great fun with dungeons that make no sense whatsoever, living creatures just waiting behind a sealed door etc. But this series began as something logically and thematically incredibly cohesive and consistent. When slowly, but surely, this premise is eroded; when what constituted the main draw and unique flair is abandoned half-way, it becomes problematic. The third module still made sense and was as much a change of pace as an invasion in one of the Dark Souls-games; but instead of a return to form, a module that could have stood by virtue of the vistas and exploration provided, the set-up herein sports several narrative and logical choices that hurt this arc and render it the one thing I hoped the arc would avoid – a bit generic. Detailed, yes, but still. Add to that the inherited minor issues (minor rules-hiccups, remnant references to 3.X) of the series and we have a module that fell short of the promise inherent in the arc’s plot. I still very much can recommend the first 3 installments of the series, yes, even the less than perfect 3rd one, but to me and my players, this one provided a frustrating anti-climax that cast a pall over our otherwise very much remarkable journey through this arc. My final verdict will clock in at 2.5 stars, rounded up mainly since I believe that this works alone well, or at least better – but within the context of the series and its themes, it sticks out like a sore thumb. As a personal recommendation; I’d advise GMs running this to heavily modify the final complex and maintain the theme of decay via failing wards and haunt-like effects throughout an exploration of ruined halls. You can get this final part of the series here on OBS!